Omega Rest Stop (trail junction 1) on Highway 20, 17.0 miles east of the junction of highways 49 and 20 in Nevada City and 10.1 miles west of the junction of highways 80 and 20 (Yuba Gap). Trail junction 7 on Highway 20, 1.7 miles east of the Omega Rest Stop. Trail junction 25 on Highway 20, 2.9 miles east of the Omega Rest Stop. The Steephollow Trail System offers an assemblage of interconnected, marked trails that almost entirely follow roads. 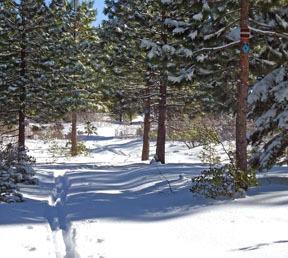 The trail system, maintained by volunteers from the Nordic Skiers of Nevada County, offers an opportunity to ski many miles without significant elevation gain or difficulty. This tour is not really a tour, but a description of the segments of the trail system that can be combined in an almost unlimited array of tours. Linking segments together can create tours as short as an hour or two, or as long as a full day. Two possible tours, the Steephollow Grand Traverse and the Steephollow Upper Loop are described separately in this guide. This area is conveniently located on Highway 20 not far from Nevada City, but off the beaten path. 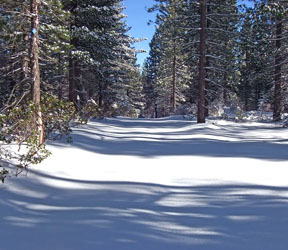 Historically this area is important because it is the location of the Nevada City Road and Washington Ridge Emigrant Trail of 1850. 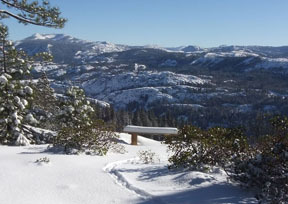 There are wonderful views to the north, east and south at points along the trail system. Be aware that there are many roads and road junctions in the area that are not described in this tour. Refer to the tour description and the map to navigate at these points. Part of this section is not on a road. This, the southern of the two routes between trail junctions 3 and 5, is part of the main trail between the Omega Rest Stop and trail junction 9, the hub for many trails in the area. This, the northern of the two routes between trail junctions 3 and 5, is located on the north side of a low ridge and is more wooded than the southern route between the same two points. Most of this segment is not on roads. There are two "Y" intersections along this segment; at both take the southern-most (right) fork. This is the easiest access route to trail junction 9, the hub for many of the Steephollow trails. Trail junction 11 is located a very short distance to the east of trail junction 9 on the southern-most route to trail junction 13. The northern-most route between trail junctions 9 and 13 is a nice change from the main road linking trail junctions 9, 11 and 13. This segment is not a road but is marked with blue diamonds. Although most of this segment is a very well defined road, crossing Steephollow Creek is not easy and the section beyond the creek to trail junction 21 is not marked and is overgrown thus making this segment of intermediate difficulty. The use of this segment is not recommended because of these difficulties. Trail junction 15 is not a road junction and is easily missed if you are not looking closely for the marker and trail number on a tree. At mileage point 32, 0.3 mile east of trail junction 13 and 100 yards east of a small clearing on the north (left) side of the road, you can leave the road and ski 75 yards north (left) to mileage point 33 (you will need to descend a little) and an outstanding vista to the north. From here you can see Sierra Buttes peaking beyond a ridge and Grouse Ridge is also distinctive. This short section descends to Steephollow Creek. This segment follows the obvious road east and then northeast. There is a prominent road junction 0.5 mile east and northeast of trail junction 15 at mileage point 34. Take the fork to the northeast (straight), not the road to the north (left). At trail junction 17 the road ahead begins to descend gradually. 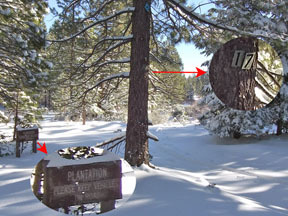 Trail junction 15 is not a road junction and is easily missed if you are not looking closely for the marker and trail number on a tree. Although technically part of this segment is on a road, it is overgrown to the point where you will not recognize it. This is the most difficult segment in the Steephollow Trail System. It must be rated 3 because of the difficulty in following the blue diamonds through dense woods. The use of this segment is not recommended because of these difficulties. This segment is not on a road but is marked with blue diamonds. After a short distance the route follows a clearing east until it intersects another road at mileage point 35. Although technically trail junction 21 is a road junction, the side road is overgrown and the only way you will know you are there is by seeing the number on a tree. But just ahead the is Steephollow Creek and trail junction 23 though 23 is not obvious either. You will have views to the southeast along this segment. This segment descends along a ridge and ends at a tee intersection. This segment parallels the highway and begins at one of the starting points. 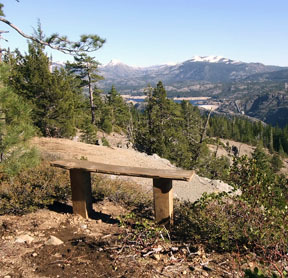 This segment leads to the best view point of the entire Steephollow Trail System. Be aware that the trail veers to the north (left) at mileage point 36. Here there is a blue diamond with an arrow on it, but you may miss it and continue straight if you are not looking carefully. There is a bench at the overlook and the lake to the east is Lake Spaulding. Signal Peak is the mountain directly beyond the dam that creates the lake. To the north (left) of Signal Peak is the steeper Old Man Mountain. Also to the east, but not obvious, are Cisco Butte and Devils Peak. Winter view from overlook. Signal Peak is at far left, Devils Peak is very small on the horizon about the 1/4 point from the right, and Cisco Butte is the dark blob to the left of Devils Peak. Courtesy of A. Clark. This section parallels the highway.